- 1.6 GHz Intel Core i5-8250U Quad-Core - 8GB of LPPDR3 RAM | 256GB SSD - 12.3" PixelSense 10-Point Touch Display - 2736 x 1824 Screen Resolution (267 ppi) - Integrated Intel UHD Graphics 620 - Wi-Fi 5 (802.11ac) | Bluetooth 4.1 - 5MP Front Camera | 8MP Rear Camera - USB Type-A | Mini DP | Surface Connect - MicroSDXC Card Slot - Windows 10 Home Microsoft combines the portability of a tablet and the performance of a laptop with the Surface Pro 6. Weighing just 1.71 pounds and measuring just 0.33" thin, the Surface Pro 6 packs an 8th Gen Coffee Lake 1.6 GHz Intel Core i5-8250U processor into a magnesium casing with a platinum finish. Use the multi-position Kickstand and the Surface Pro Type Cover (sold separately) to turn the Surface Pro into a laptop. The updated Surface Pen (sold separately) provides up to 4096 levels of pressure sensitivity while the Surface Dial (also sold separately) allows for on-screen interactions. The Surface Pro 6 features a 12.3" PixelSense display with a 2736 x 1824 screen resolution (267 ppi) and a 3:2 aspect ratio. The display also supports 10-point touch, so you can take full advantage of the multi-touch gestures incorporated into Windows 10 Home. If you want to play video on an external display, you can do so using the Mini DisplayPort output. The 8th Gen Intel Core i5-8250U processor has a base clock speed of 1.6GHz and can be boosted up to 3.4GHz when performing demanding tasks. It also has integrated Intel UHD Graphics 620. The Surface Pro 6 has 8GB of LPPDR3 1866 MHz RAM, a 256GB SSD, a microSDXC card slot, Wi-Fi 5 (802.11ac), Bluetooth 4.1, a 5MP front-facing camera with Windows Hello face authentication sign-in, an 8MP rear-facing camera with 1080p HD video recording and autofocus, and dual integrated microphones for Cortana, Microsoft's intelligent assistant. There are also built-in stereo speakers with Dolby audio. Windows 10 Home is the installed operating system. 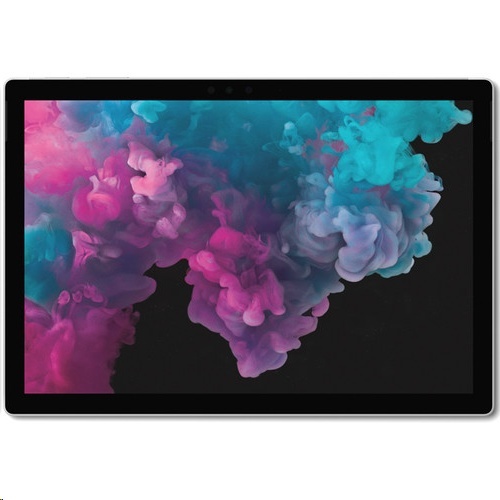 Surface Pro 6 12.3" PixelSense 10-Point Multi-Touch Display Featuring a 2736 x 1824 screen resolution with 267 pixels per inch, the 12.3" PixelSense display provides a high-res, clear viewing experience. Use the multi-position Kickstand for a hands-free way to watch movies. The display is also a touchscreen, so you'll be able to utilize the multi-touch gestures incorporated into Windows 10 Home. You can also output video to an external display via Mini DisplayPort. Intel Dual-Band 802.11ac Wi-Fi Featuring Intel dual-band 802.11ac Wi-Fi, the Surface Pro 6 delivers faster internet access, broader coverage, and longer battery life than was available with previous Wi-Fi standards. The Surface Pro is also backwards compatible with 802.11a/b/g/n Wi-Fi networks. The Surface Pro also comes with Bluetooth 4.1, so you'll be able to connect wirelessly to Bluetooth-compatible peripherals and accessories. The Portability of a Tablet Weighing in at 1.71 pounds and measuring 0.33" thin, the Surface Pro can be used in classes, at meetings, or on the road. The bright, responsive touchscreen and the high-quality speakers with Dolby audio provide an immersive viewing experience, while the front 5-megapixel camera allows you to video chat with friends and family in high resolution. Windows 10 Start Menu After its hiatus in Windows 8, the Start Menu has returned. Utilizing a combination of the traditional menu system and Windows 8's Live Tiles, the improved Start Menu gives you more information at a glance, showing notification information alongside your applications and other pinned items. Cortana Microsoft's digital personal assistant, Cortana can answer your questions with information gleaned from both your device and the internet at large. You can type or even talk with her, if your system has a microphone. Using her Notebook, Cortana keeps track of your needs and wants, and she learns over time to improve her information gathering skills. Microsoft Edge After nearly 20 years, Microsoft has finally replaced its Internet Explorer web browser. With Microsoft Edge, users can write directly on web pages and share notes with friends and colleagues. It also improves the online reading experience by adding a distraction-free mode and read-it-later functionality. Edge also has built-in Cortana integration; you can have her help you find a restaurant, make a reservation, and pull up directions without leaving your browser. Windows Store For Windows 10, Microsoft has unified the Windows Store. Now, apps for PCs, tablets, and phones will all be accessible from one place. And with support for Universal Apps, one version of an app can work across all your compatible devices automatically. Windows Continuum Windows 10 was designed for a variety of screen sizes and input styles, and with its Continuum feature, it automatically adapts to fit your needs. A Windows 10 tablet on its own requires a touch-centric approach, but attaching a mouse and keyboard will shift everything to a more traditional interface. You can even attach an external monitor to your Windows 10 phone for a near-desktop experience. But it's not just the operating system; Windows Universal Apps take advantage of Continuum as well. Xbox on Windows 10 Gaming is a big focus of Windows 10. Xbox integration allows for PC players to match up against Xbox One players on supported games, and if you have an Xbox One, you can even stream compatible titles to your PC. Native support for recording with the new Game DVR feature makes it easy to capture and share your gameplay. The new DirectX 12 takes better advantage of multi-core processors, giving games a performance boost, even on older hardware. Windows 10 also features native support for virtual reality headsets, such as the Oculus Rift.